How Long Have Women Been in the Military? Bradley Craig is a former HNN intern. 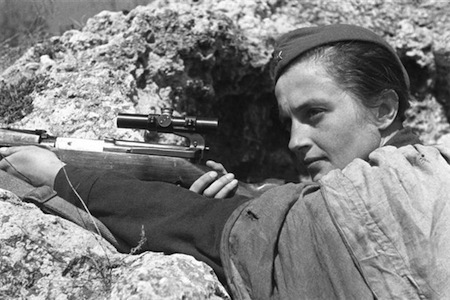 Lyudmila Pavlichenko, the leading female Soviet sniper of World War II. After more than a year of planning, Defense Secretary Leon E. Panetta overturned the ban on women's ability to serve in combat roles in the United States military. Panetta's removal of the ban followed an official recommendation by the Joint Chiefs of Staff chairman General Martin E. Dempsey. This decision to allow women to occupy the front lines came yesterday as a formal gesture following the last decade of women's unofficial service in combat positions; since 2001, around 280,000 women have been deployed to Iraq and Afghanistan. While the Senate Armed Services Committee may have an opportunity to reverse the decision through legislative means, prospects look hopeful for this shift in the military's stance, which was largely a decision made internal to the military itself. By May 15 of this year, the different branches of the armed services are expected to present specific implementation plans for their integration of women into combat roles, including requests for exceptions to the new policy. The military's exclusion of women from combat follows a number high profile lawsuits such as the one filed by the American Civil Liberties Union in November 2012. Such cases have called attention to the fact that although women had been injured in combat, they were still unable to officially assume certain leadership roles. The recent rollback of the women in combat ban acknowledges women's dedication to service while making available to them previously withheld opportunities for advancement, including close to 184,000 positions according to one report. Similarly, William G. Boykin, a retired Army general, issued a statement released through the Family Research Council describing the decision as “another social experiement.” Boykin cited “personal hygiene” as a central concern regarding women's ability to serve in combat. Apparently placing women in combat may threaten military readiness -- or at least so says Heather MacDonald in a piece for the National Review. She suggests that women's lack of upper body strength will require lowered physical fitness standards in order to facilitate their inclusion. The potential consequences of lifting the ban are supposedly numerous: an outbreak of promiscuity within the armed services, an increase in the incidence of sexual violence against women in the military, and the erosion of important social values such as chivalry rank among MacDonald's top concerns. Yet a long history of women serving in combat roles stands in the face of such reactions. Linda Grant DePauw, professor emeritus at the George Washington University, has argued that at least a few hundred women fought in the American Revolutionary War. In her essay, “Women in Combat: The Revolutionary War Experience,” DePauw throws a spotlight on an oral tradition that offers evidence of women's participation in artillery units. Women frequently carried the water used to swab out canons. Some four hundred women, according to DePauw, also passed as men in order to serve in the Civil War. Women also played active roles in World War II. An article in the Journal of Military History describes the participation of German, Soviet, and British women in the conflict. D'Ann Campbell, author of the book Woman at War with America, writes that although American women did not enter into combat, women elsewhere came closer to the front lines. British General Frederick Pile decided to begin experimenting with mixed batteries in 1938. But in both Britain and Germany, while women learned the ins and outs of the artillery, they were prohibited from firing weapons. The Soviets were the major exception to this wariness towards women in combat roles. Campbell estimates that around 400,000 women were the Red Army's front-line duty units during World War II. Reina Pennington's essay “Offensive Women: Women in Combat in the Red Army in the Second World War” examines in detail Soviet women's fulfillment of combat roles. In addition to serving as medical personnel, women in the Red Army also made parachute drops behind enemy lines, engaged in air defense, operated machine guns, and acted as snipers (Lyudmila Pavlichenko killed over three hundred Germans during the war). Pennington, a professor at Norwich University, notes that researchers have only begun to scratch the surface of women's history in combat. So while critics have been vocal about the supposed justifications behind Defense Secretary Panetta's decision and offered speculation about its ramifications, history shows that women participating in combat is not a totally novel phenomenon. Not just part of the advancement of a so-called political agenda, yesterday's decision promises to grant women in the United States the chance to serve as so many women already have in the past.